BanaBay produces top-quality bananas that give you the refreshing taste and pleasure of real fruit in a fun, convenient way. 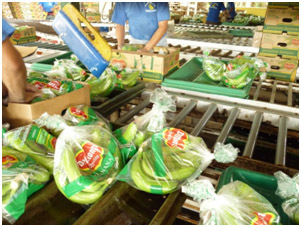 Our R&D and Agricultural Services departments are always innovating to ensure that the physical needs of our bananas are addressed in order to protect and maintain freshness of the product. Our packaging is designed for easy packing, rapid cooling and protection of the product from the rigors of transportation. Our bananas are grown in two of the most important banana producing counties in Ecuador, from where they are shipped to their global destinations in refrigerated containers. After arrival at the destination ports, the containers are unloaded and transferred ripening facilities, then they are taken to distribution centers or delivered directly to the customer by refrigerated transport. This process requires extraordinary attention to quality in both product and packaging to assure fresh arrivals. With fresh fruits, the challenge is to design packaging solutions (primarily recyclable corrugated) that will hold up to the rigors of transport and handling while protecting the fruit from bruising when exposed to moisture, shock and vibration. In order to accomplish this objective, the experts in our packaging department work to design packaging and graphics, choosing the correct materials and also indicating pallets and loading specifications. In our operations, we are also able to use recyclable plastics. This helps BanaBay to fulfil our customers´ needs and to deliver the freshest and most visually appealing product to every one of our retailers every single day while also preserving the environment.